Color change called "melanosis (black spots)" consists in shrimp and crustacean as a result of enzyme activity during storage (Figure 1). Mela-nosis has no health risk for consumer. This color change is the main reason for economic loss in world shrimp trade which is accepted as spoiled product in the eyes of the consumer. For the solution of this trouble, many chemicals have been developed for commercial applications. One of them is 4-hexylresorcinol that its use has increased in recent years. 4-hexylresorcinol prevents from polyphenol oxidase (PO) that it is found under shrimp shell and in it. Thus, melano-sis is delayed. But 4-hxylresorcinol remains residue such as other chemicals and its usage is limited with legal limit values (Collins-Williams 1983; McEvily et al. 1991; Montero et al. 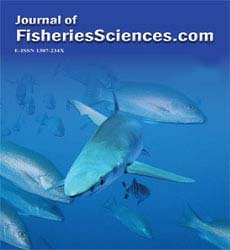 2006, Mendes et al. 2006). Maximum acceptable residue levels for this agent in raw material in China and Canada is 1 mg/kg, whereas it is accepted as 2 mg/kg in European Union (GB 2760-1996, 1996; Food and Drug Regulation 1078, 1998; EU Scientific Committee on Food, 2003). Figure 1: Melanosis formation in shrimp (Varlik et al., 2007). Figure 2: 4-hexylresorcinol standards peak. 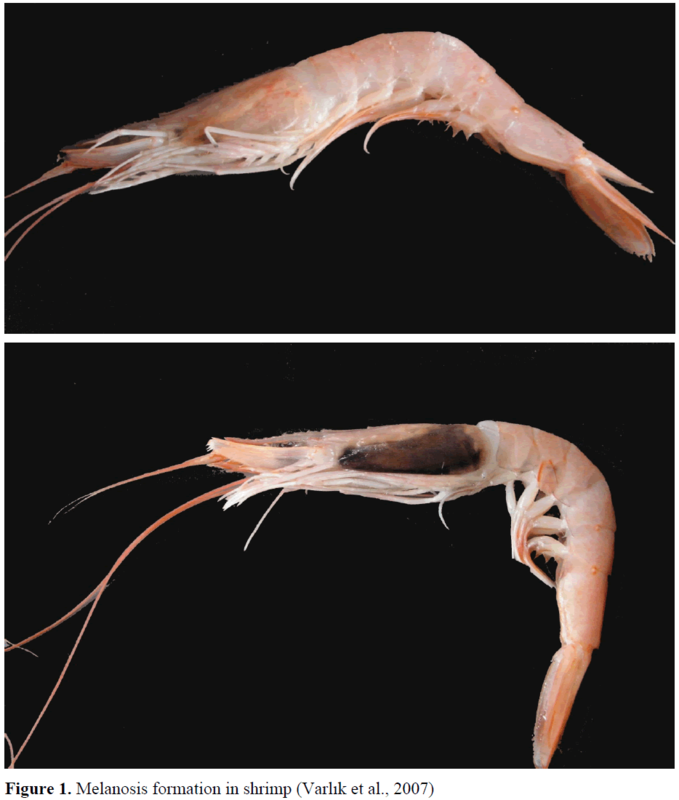 4-hexylresorcinol is a new additive in fisheries because it inhibits development of enzymatic browning melanosis in a variety of storage situations which developes rapidly in shrimp, in lobsters after catching and during iced storage (Montero et al. 2004; Mendes et al. 2006). The detection and quantification of 4-hexylresorcinol in shrimp are achieved by HPLC. Reverse phase HPLC method coupled with florescence detector is preferred for quanti-fication of 4-hexylresorcinol levels in food, because of its better selectivity, accuracy and sensitivity. The objective of this study was to investigate determination of 4-hexylresorcinol levels in shrimp flesh compared to other methods in terms of analysis time and sensitivity. Deep water pink shrimp samples (Parapenae-us longirostris, Lucas 1846) were collected from the Marmara Sea, Turkey. 4-hexylresorcinol value was analyzed by a HPLC method modified from Jonker and Dekker (2000). Instrument: Shimadzu LC 10 AT Vp series pump, Shimadzu SIL 10AD Vp cooling automat-ic sampling (4°C), Shimadzu RF 10AXL fluores-cence detector (FLD), Shimadzu CTO 10AV Vp, Shimadzu SCL 10A Vp and Shimadzu Class-Vp 6.14 (Shimadzu Corporation, Japan). Standard solution: Stock standard solutions (500 ppm) of 4-hexylresorcinol was prepared by dissolving 50 mg in 100 mL of methanol. The standard solution can be stored for at least 6 months in brown glass (in freezer -18°C). Buffer stock solution (5 ppm) was prepared by dissolving 1 mL stock standard solution in 99 mL of methanol. Working standard solutions in the concentration of 1, 5, 10, 50, 100, 250, 500 and 1000 ppb were prepared daily by dilution of buffer stock solution in mobile phase. Calculation: The concentration of 4-hexyl-resorcinol (μg 4-hexylresorcinol/L) was calculated from the regression equation derived from the standard curve. Limit of detection (LOD), Limit of quantification (LOQ), accuracy (recovery- trueness, re-peatability and within reproducibility – precision) have been studied to determine method performance criteria by single laboratory validation. LOD and LOQ: LOD and LOQ were determined by analyzing 10 independent fortified samples at a very low level and calculated with mean plus 3 standard deviation and 10 standard deviation, respectively. Accuracy: For accuracy study, two levels spiked samples were prepared and 18 replicates have been performed in each level. 1 mL of 4-hexylresorcinol was added into blank samples from 7,5 mg/L and 12 mg/L standard solutions to obtain 1.5 and 2.5 mg/kg concentrations respectively. Samples have been stored in a dark and ambient temperatures for 2 h before extraction. For each level, 18 samples were analyzed as 6 replicates in three independent analytical runs. Repeatability and within reproducibility were calculated according to ISO 5725-2 (1994) expressed as coefficient of variation. Recovery was calculated according to Eurachem Guide and expressed as percentage. Linearity: Two calibration curves were prepared at 5 concentration levels and triplicate measurements at each level (Curve 1: 1, 5, 10, 50 and 100 ppb, Curve 2: 100, 250, 500, 750 and 1000 ppb) by linear regration. 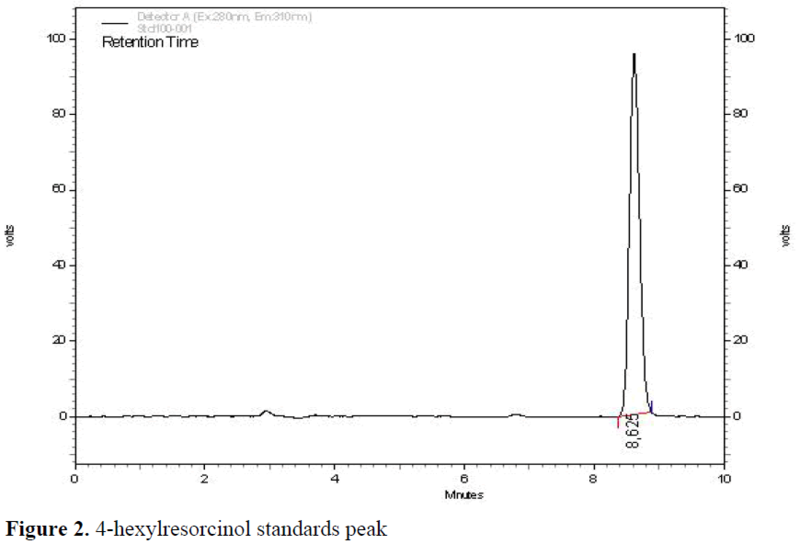 4-hexylresorcinol concentration in samples were determined with the aid of the instrument software by using the calibration curve. Validation scheme: The present method was optimized and validated according to “The Fit-ness for Purpose of Analytical Methods – A Laboratory Guide to Method Validation and Related Topics” (Eurochem Guide-1998). Results were presented with mean and stand-ard deviation of values (n=3) in the tables. The standard deviation and coefficient of determina-tions (r2) were determined using STATISTICA 7 (StatSoft Tulsa, Oklahoma-USA). Typical HPLC chromatograms of 4-hexyl-resorcinol were presented in Figure 3 and Figure 4. 4-hexylresorcinol was separated at 280 nm (excitation) and 310 nm (emission) wavelength in less than 10 min. 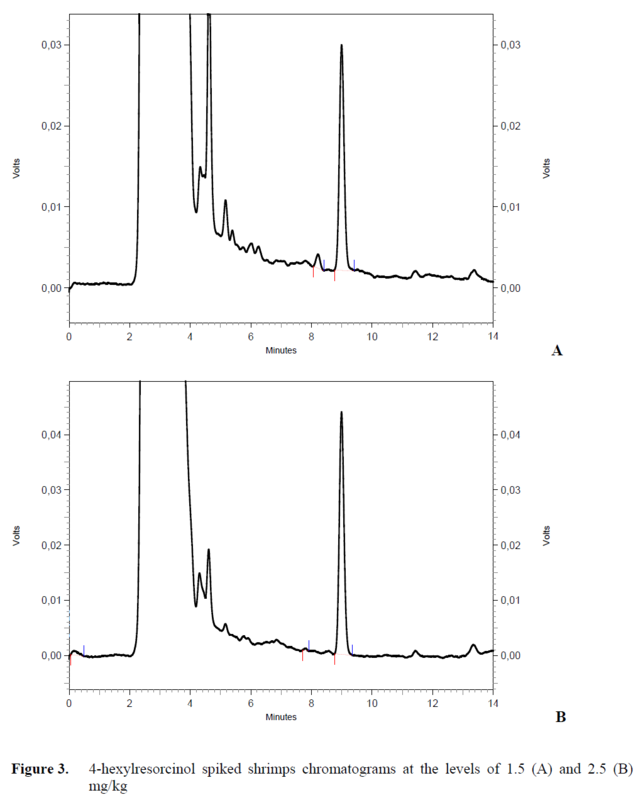 Figure 3: 4-hexylresorcinol spiked shrimps chromatograms at the levels of 1.5 (A) and 2.5 (B) mg/kg. LOD and LOQ values of the method for 4-hexylresorcinol were presented in Table 1. Table 1: LOD and LOQ of the method for 4-hexylresorcinol. The recovery, repeatability and reproducibility ranged between 94.68 to 94.80%, 1.23 to 2.51% (CVr), and 1.89 to 2.74% (CVR), respec-tively (Table 2). General acceptance range is between %70-110 for recovery studies and recovery obtained in this study was good in trueness. These results show that the method has a good precision due to its high recovery and low CVr and CVR values. Table 2: Results for recovery, repeatability (CVr) and reproducibility (CVR) in 4-hexylresorcinol. Regression analysis was performed for cali-bration and correlation coefficients (r2) were ob-tained over 0,999 in each curve (Table 3). Table 3: Linearity of 4-hexylresorcinol. Jonker and Dekker (2000) have found the pooled recovery 81.6%. The confidence interval was ranged from 81.6 % to 95 %. The relative standard deviation (RSD) for the range of appli-cation (1.5–2.5 mg/kg) was 2.1 %. With this work, we decreased the time for pre-liminary preparations and increased sensitivity of the study. It can be concluded that the presented method (HPLC-Fluorescence) has potential to be used for quantification of 4-hexylresorcinol in shrimps due to its rapidness, simplicity, reliability and sensitivity. The validated method has a good overall recovery, repeatability and reproducibility and also low LOD and LOQ value. It can sepa-rate 4-hexylresorcinol at 280 nm (excitation) and 310 nm (emission) wavelength in less than 10 min and also provides minimal sample prepara-tion. The average analysis time (sample prepara-tion, extraction, separation and quantification) takes approximately 40 min. This work was supported by the Research Fund of Istanbul University with the projects UDP-6182. Collins-Williams, C., (1983). Intolerance to addi-tives, Annals of Allergy, 51: 315-316. Eurachem Guide, (1998). The Fitness for Purpose of Analytical Methods, A Laboratory Guide to Method Validation and Related Topics. The Fitness for Purpose of Analytical Meth-ods. LGC (Teddington) Ltd. 1-61. GB 2760-1996, 1996. Food Additives Hygiene Standard. Published by Ministry of Public Health, PR China. Horwitz, W., Albert, R., (2006). The Horwitz Ra-tio (HorRat): A Useful Index of Method Per-formance with Respect to Precision, Journal of AOAC International, 89(4): 1095-1109. ISO 5725-2, (1994). Accuracy (Trueness and Precision) of Measurement Methods and Re-sults-Part 2: Methods for the Determination of Repeatability and Reproductibility of a standard measurement method. International Organization for Standardization, Reference number IS0 5725-2:1994(E). Jonker, M.K., Dekker P.C., (2000). Determina-tion of 4- hexylresorcinol in Shrimp by Liq-uid Chromatography with Fluorescence De-tection, Journal of AOAC International, 83: 241-244. McEvily, A.J., Iyengar, R., Otwell, S., (1991). Sulfite alternative prevents shrimp melano-sis, Food Technology, September, 80-86. Varlik, C., Özden, Ö., Erkan, N., Alakavuk Uçok, D., (2007), Su Ürünlerinde Temel Kalite Kontrol, Istanbul Üniversitesi Yayin No: 4662, Fakülte Yayin No: 8, s. 1-202, Istan-bul.